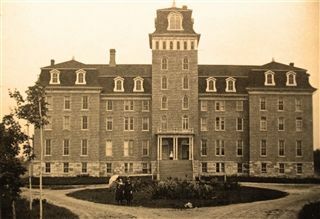 In 1870, a group of Wesleyan ministers met in Sherbrooke and agreed to build a college in the Eastern Townships. Stock sold at $25 a share, with the hopes of raising $20,000. Whichever community put up $10,000 would be home to the college. Compton was ready to put up $10,000 but Stanstead offered $15,000. The Wesleyan Conference approved the project for Stanstead College in June 1871. Construction began in the fall of 1872, with the cornerstone being laid on December 2, 1872 and the College incorporated on December 24. Construction took place through 1873, and the first classes began in the first week of January 1874. Rev. A. Lee Holmes was the first principal. The slow sale of shares coupled with the low tuition ($5-$10/term plus $2.75/week for room and board) compelled the stockholders to transfer the property of Stanstead Wesleyan College to the Montreal Conference of the Methodist Church of Canada in December 1876. In the eighties, Stanstead College ended its formal relationship with what by then had become the United Church of Canada and is today fully non-denominational. 1894 – Dr. and Mrs. A.G. Bugbee of Derby Line donate the residence of Albert Knight, former Stanstead MLA, and have it moved across the field to the College grounds to be used as Bugbee Business College. 1896 – The Pierce family donates Sunnyside Castle to be used as a girls residence. 1902 – The Holmes family donates $3000 to build a grade school for local children, known as the Holmes Model School. It opens in 1903 and remains the local school until 1952 when Sunnyside School is built. 1905 – New gymnasium built. 1931 – Rev. E.C. Amaron becomes principal, remaining so for 23 years. 1938 – Fire destroys the main building. A new main building, later named Colby House, opens in 1940. WW II – During the war, the College hosts evacuees from Oldfeld School in Swanage, Dorset. 1946 – Alumni Association donates memorial gates. 1951 – Pierce Hall is destroyed by fire. 1958 – Faced with declining enrollment, the school closes Bugbee Business School and the Eastern Townships Music Conservatory. Pierce Hall is rebuilt. Davis House for senior boys and Bugbee House for junior boys open. 1959 – Stanstead College becomes an all-boys residential school. Most local students henceforth attend public schools, including the newly expanded Sunnyside School across from the College. 1965 – Amaron Gymnasium opens. 1968 – LeBaron Hall opens. 1973 – A year of centennial celebrations includes the opening of the Ralph B. Hood Swimming Pool and a visit by Governor-General Roland Michener. 1977 – In the face of Bill 101, Stanstead College chooses to no longer accept the per-student subsidy from the Quebec government. The resulting independence allows the school to maintain control over its policies, including allowing francophone students to enroll without certificates of eligibility. 1979 – Stanstead College returns to co-ed status. 1991 – A new residence for senior girls, Webster House opens. 2001 – The Rec Hall is destroyed by fire. Eight months later a new student centre is built and later named the Eric T. Webster Student Centre. 2004 – The school introduces individual laptop computers into the classrooms and the curriculum. 2007 – The College purchases neighbouring "Broadview," also known as "Butters House," to house its Advancement Department. 2011 – The Pat Burns Arena opens. 2012 – The swimming pool is converted to a second gym, the W. John Mackay Gymnasium. 2015 – Stanstead College acquires Centenary United Church from the dwindling local congregation. 2018 – Construction begins on Cowen House, a new residence exclusively for Grade 12 students, scheduled to open fall of 2019.